Music streaming service MOG is gaining droves of users in recent months, spurred largely by the September debuts of a free listening component, and Facebook integration. Recently MOG reported that its monthly average users have reached 160,000, up 264% for the month of October. Like its competitors, MOG offers both free and paid subscriptions of its 13 million song catalog. MOG entices users to spread the word about the service. The free ad-supported version gives listeners the opportunity to continually earn song plays through a refillable tank called FreePlay. It is built upon sophisticated game mechanics that enable users to earn free music by listening, creating and sharing playlists, exploring the site, and referring friends to MOG. Another way to fill the virtual music tank is by interacting with advertisers, for example watching a movie trailer. The paid Primo account is $10 per month and gets the user unlimited on-demand streaming. For audiophiles, MOG offers high quality streaming at 320kbps. 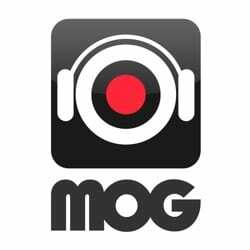 MOG Primo includes ad-free music, and access to MOG via mobile and handheld devices. Users can download songs to play back on their devices even when internet access isn’t available. MOG is the first company to offer integration of an on-demand music service in the car. In the US, MOG is available on select 2011 BMW and MINI vehicles. In order to activate MOG, the user must have a Primo account. Skeptics have questioned a driver’s ability to safely operate MOG’s in-car system while driving, but the company maintains that the system is easy to control through the vehicle’s existing infotainment center and steering wheel buttons.